In 1938, Dr Clarence Beeby brought his radical ideas about the value of the arts into the heart of our public education system. Art and Crafts and Physical Education Advisers were introduced that year under the new assistant Director of Education, with experimental programmes trialled in Wellington and Dunedin. Two years later, Beeby became the Director and he dedicated 20 years to modernising an education system suffering from centralisation and conformity. Valuing and supporting the arts was a big part of modernising the system. In 1945 an art scheme was developed and in 1946, a National Art Specialist Team was born. Tauranga artist Rob McGregor was one of those specialists, from 1975 until he took voluntary redundancy in 1999 as the service quietly wound down. As an admirer of Beeby’s vision and legacy, McGregor is disheartened by the current state of the arts in our schools. “We’re taking the hands-on experiences out of education and retaining only words. We’re hung up on this idea that education should be just for the future, for a job,” he says. And yet, says McGregor, every country that has sidelined the arts to focus on lifting literacy and numeracy has instead seen literacy and numeracy achievement drop. “Anything that’s ever been invented or innovative relies on taking a risk and doing something that might fail half a dozen or a hundred times before getting it right,” he says. From the 1970s, McGregor’s job was to support the ongoing education of teachers in the arts, by running training programmes, demonstrations, follow-up visits and sourcing quality art supplies for schools. Prior to 1989, every school had a fairly substantial budget to spend on art resources, he says. However, with the introduction of Tomorrow’s Schools, the funding was rolled into operations grants, where art resources now compete with all the other essential costs of running a school. 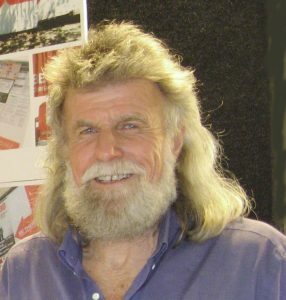 In 1975, the “sinking lid policy” was already underway, with four arts advisers across Tauranga and Hamilton compared to eight not long previously. By 1985, McGregor was the sole adviser for the region, making it impossible to visit his 200 schools over the course of a year. Adviser numbers fluctuated over the next few years, but by the time the service was finally shut down in the early 2000s, McGregor believes few teachers and schools would have noticed the demise of the decimated service. “I think by the time we had become so thin on the ground with only one adviser running around, advisers were less likely to be missed. They’d also changed the way advisers had to work – just pick a number of schools to be ‘beacon schools’ – of course no one’s going to go to another school to see how it works. It ended with a fizzle rather than a bang,” he says. McGregor says the primary function of the arts is not to impart or gain information. McGregor hears people saying students should study accounting rather than art at high school because it’s more “useful”.